Action from Farsley Celtic's recent game against Grantham. Picture: John McEvoy. 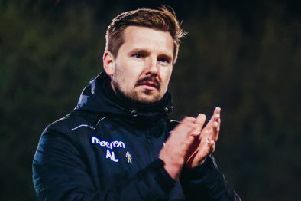 Farsley Celtic manager Adam Lakeland is relishing the fight as his side battles for promotion at the top of the Evo-Stik League Premier Division. Celtic host bottom club North Ferriby United tomorrow, going into the weekend three points off the top with a game in hand over leaders South Shields. Farlsye Celtic manager Adam Lakeland. 'Picture: John McEvoy. They have spent the season punching above their weight against teams with vastly superior spending power to their own, but Lakeland is far from envious. “Money and resources, they certainly help, but for me, it can also hinder you,” he said. “You can attract the wrong kind of personalities and players to your club – not in all cases, but in some cases. “For us, it’s just been about recruiting the right kind of people and I think we’ve done that very well over the last 18 months. We might not have as big a budget as the clubs that are around us, but we’ve got bigger hearts than them and our team spirit is unshakeable. “So we might not have as big a budget as the clubs that are around us, but we’ve got bigger hearts than them and our team spirit is unshakeable. Farsley are on good form and, going up against a North Ferriby side with just 10 points from 28 games, will be expecting to claim another three points. Lakeland is confident in his players’ attitude and ability. But he isn’t expecting their opponents to roll over, and has urged his side to maintain their professionalism after a number of games against teams higher up the league table. “You know your players are going to be motivated and expecting a difficult game when you’re playing one of the teams around the top of the league like we have in recent weeks with South Shields and Scarborough,” Lakeland said. “The motivation levels and concentration levels kind of take care of themselves. “But it’s these games, against the teams that are toward the bottom who are fighting for their lives where you can look at the league table and think you only need to turn up to get the three points. “That’s never the case in this division. “First and foremost we need to make sure that we play well and we respect North Ferriby. “Obviously we’re looking for three points as we do in every game and, hopefully, we can then go on and win the game and win the game well. It has been a successful week already for Farsley, having progressed to the semi-finals of the Integro League Cup with a thumping 5-0 win at Stafford Rangers on Tuesday. Some managers see cup competitions as a distraction, but Lakeland wants to win it all. “I’ve never hidden the fact that I’m ambitious and the club is ambitious,” he said. “We want to go as far as we can in every competition that we’re in. In the Evo-Stik East tomorrow, second-placed Brighouse Town host Stamford while third-placed Pontefract Collieries host seventh-placed Loughborough Dynamo. Elsewhere, Tadcaster Albion welcome Wisbech Town and Ossett United play AFC Mansfield. Frickley Athletic travel to second-bottom Spalding, while Pickering Town make the trip to bottom club Gresley.